It always seemed so out of character for Jesus to kill 2,000 pigs in the healing of the lunatic by the sea of Galilea. Dr. Dearing’s translation and commentary offer some interesting context, linguistic clarification — and a different ending to the story. 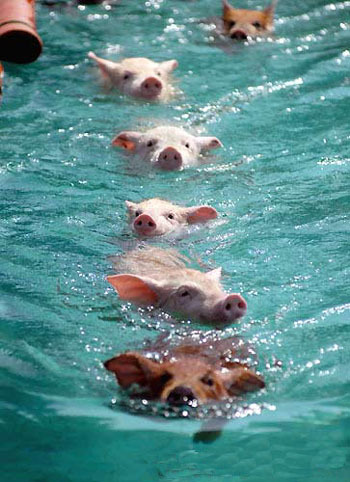 Hint: while pigs may not fly, they do swim rather well. Here is the complete passage from The Great Physician, pages 268-272, without footnotes. When the boat came to shore and Jesus disembarked, he was met by and healed a demoniac according to Mark and Luke, two demoniacs according to Matthew. While there are many other dis­crepancies between the Gospels, so that some readers believe there were two very similar incidents at this time, others, including myself, believe there was only one, and that Matthew’s account of it is not as correct as Mark’s and Luke’s. It is also true that Matthew’s account is more summary than theirs and demands more explication. According to Mark and Luke, this healing was unique among those performed by Jesus in three ways. First, Jesus asked the man to diagnose his case. Second, he allowed him to propose an alter­nate method of relief. Third, he told the man to tell others about his healing. All these circumstances, however, can be explained if we realize that the man was a Gentile. We see, then, that what I have just called the first two unique aspects of the healing were really Jesus’ usual practice of getting his patients to join in their healings through their faith, but it was here adapted to a Gentile atmosphere. That is, Jesus aroused the man’s interest in the possibility that he might be healed, and then healed him in God’s way. For Jesus to have first explained what he was about to do might have troubled and perplexed the man, turning him against his own interests, but afterward, to fix the truth in the man’s mind, Jesus told him that God had healed him and that he should bear witness to the fact. A Gentile among Gentiles would find no one objecting that the healing could not have been God’s work because it had been performed by a man who healed on the Sabbath and ate with publicans. The former demoniac would find no one seeking to overturn his healing and could safely repeat what Jesus had told him about how it had happened. I continue then with Mark, with whom Luke is essentially in agreement. “And he says to him, ‘Legion [is] my name, for we’re many’ [that is, there are too many demons for you to handle; as we have noted, a Roman legion had about six thousand foot soldiers]. And he was calling on him a great deal not to send them out of the territory [Luke says, to prison under the earth]. “And the unclean spirits went out [of the man] and went into the pigs, and the herd rushed down a steep place into the sea, about two thousand of them, and were choking. And those feeding them fled and told [it] in the city [in which, Luke says, the man had lived before], and in the fields. “And [people] came to see what it was that had happened, and they come to Jesus and see the demoniac who had had the legion sitting, clothed and sensible, and they were frightened. And those who saw [it] described to them how it happened with the demoniac and about the pigs. And they began to call on him to go away from their borders. “And as he was getting into the ship, the man who had been a demoniac was calling on him to be with him. The Decapolis was a geographical, not a political, unit, of uncertain and very possibly changing definition. Its name indi­cates that at one time, at least, it was regarded as having ten cities in it. Damascus, the capital of Syria, seems to have been the most northern of these, Philadelphia, modern Amman, now the capital of Jordan, the most southern. Except for Scythopolis, ancient Beth Shean, the cities of the Decapolis were east of the Jordan. The culture of the Decapolis was predominantly Greek. Matthew, which often scants the details of Jesus’ healings, gives none of what Jesus said before the demons asked to be sent into the pigs, namely, “Come out of the man, unclean spirit,” and, when that frightened the man, “What’s your name?” To repeat, Jesus’ question was a first step in getting the sufferer to take an active part in his cure. In the language of spiritual healing, the statements that God destroys evil and that evil destroys itself are synonymous. Does the dashing wave destroy itself upon the rock or does the rock destroy it? Do the clouds lift or does the sun come out? Hence we may say three things about the healing. First, Jesus led the man step by step from refusing all help to saying he was incurable and on to proposing a cure, and then healed him; he let nothing dissuade him from his work of love. Second, the dementia, claiming the power of a legion and yet proposing an armed truce and afterwards even a cure, seems to have dashed itself upon the rock Christ, self-seen as not omnipotent after all. Third, Jesus paid no attention to the proposed therapy but proceeded with the true one. And in addition, as we have seen, one of Jesus’ parables tells of a demoniac whose unclean spirit left him for a time but found no home elsewhere and so returned, bringing other and worse spirits with him. The message of the parable is that we are not to leave a place within our mind for demons to return to, that is, we must replace evil and unhealthy thoughts with good and healthy, not leave a vacuum. Jesus’ telling “Legion” to report what God had done for him was prophylaxis against such a vacuum. Although I have spoken of the man as proposing that the demons be sent into the pigs, the Gospels, of course, say that the demons made the proposition. As I understand Mark, the demons said “Send us into the pigs,” and Jesus left it up to them. According to Luke, the demons said, “Permit us to go into the pigs,” and again Jesus left it up to them. But the words I have translated “he left it up to them” (the same words in both Gos­pels) may also be translated “he permitted them” or even “he commanded them.” According to Matthew, Jesus said to the demons “Go away,” which may but need not be interpreted as an order to go into the pigs. According to Mark, as I understand its words, the pigs rushed into the lake and “were choking.” But the verb may also be translated “were drowning.” In Luke, essentially the same verb (it has a prefix lacking in Mark) is in the aorist instead of the imperfect tense, and therefore can be translated either “started to choke/drown” or else “choked/drowned.” Matthew has a different verb but the same tense as Luke, “started to die” or “died.” Thus Jesus may but need not be understood to have caused the death of two thousand pigs to heal one man. Many people, of course, be­lieve that two thousand pigs are not too high a price to pay for a man’s mental health. What can those who disagree offer as counter-evidence? First, that pigs are good swimmers; second, that Jesus did not need to kill pigs in order to heal; and third, that pigs can stampede for many reasons. There is only one place on the east side of the Sea of Galilee where pigs could bolt down a steep place into the lake, and a village named Gergesa, modern El Kursi, is nearby. It therefore seems likely that the “Gerasenes” were not citizens of Gerasa, modern Jerash, which is 37 miles from the lake, but inhabitants of Gergesa. Matthew says the healing took place in the territory of the Gadarenes. Although Gadara, modern Umm Qeis, is only about six miles from the lake, still it seems likely that the people who came out to see Jesus were from Gergesa. Matthew may have thought of the villagers as residing within the polit­ical boundaries of Gadara, but Hippos, another city of the Decapolis, was much closer, being on the lake shore about three miles south of Gergesa. Varying rainfall, together with modern use of the lake as a reservoir for irrigation water, causes its level to rise and fall periodically. Sometimes, at least, there is a narrow shore at the steep place on the east side. If that was the case at the time the pigs stampeded, some of them may not have gone into the water at all. 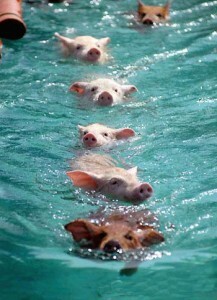 As for the rest, pigs being good swimmers, they presuma­bly made their way to shore at one side of the steep place or the other, and coughed up the water they had swallowed. Some think that the demoniac caused the pigs to bolt (we see elsewhere that sometimes demoniacs became noisy and convulsed before they became calm and rational under Jesus’ treatment). Others suppose that the swineherds went to watch the healing, leaving the pigs, which the storm Jesus had recently calmed had made skittish. I see no way to decide exactly what made the pigs stampede, except that it was not Jesus’ sending demons into them. He must have simply refused to argue with the demoniac and gone about the business of healing him. This entry was posted on Saturday, February 23rd, 2013 at 11:35 pm	and is filed under Bible Commentary. You can follow any responses to this entry through the RSS 2.0 feed. Responses are currently closed, but you can trackback from your own site.